Sean Dyche berated Burnley's profligacy as the inquest opened in to their Carabao Cup defeat to Burton Albion last month. The Clarets had put four past AFC Bournemouth just days previous to the tie at the Pirelli Stadium, but that had been an anomaly in the early parts of a season where they had been struggling for goals. Creativity wasn't the issue. However, converting those opportunities was becoming a major problem. It had proved costly against Southampton, in the first half against Watford and against the Brewers. Since that cup exit, though, that particular pattern has flipped. Burnley have become clinical, finding that cutting edge in front of goal, but opportunities have been at a premium. You couldn't knock the conversion rate of Sean Dyche's side in South Wales as they scored both shots on target to claim three points. And it was the same again when Huddersfield Town arrived at Turf Moor. Sam Vokes buried one of Burnley's two shots on target in the opening half. It was a formula in which the Clarets were having difficulty in balancing. One minute the Clarets are creating and not scoring, the next their inventive edge has slipped yet they're scoring when it matters. The only other attempt to trouble Jonas Lossl's goal came in the seventh minute. Ashley Westwood's delivery was a peach but the Danish international goalkeeper clawed on to Vokes's header on the line. The Terriers, on the other hand, weren't short of ideas, though they didn't have to think for themselves when Ben Mee conceded possession in his own third. Laurent Depoitre really should have made the defender pay when picked out by Aaron Mooy but James Tarkowski, called up to the England squad this week, got across well to make a spectacular block. 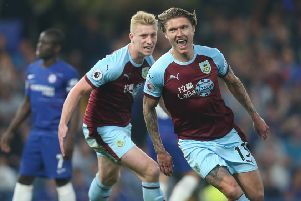 Burnley took the lead in the 20th minute and it was Johann Berg Gudmundsson and Vokes who continued from where they left off. Having combined to net the winner against the Bluebirds, the Icelandic winner dropped the ball on to the head of his team-mate once again and the Welshman shrugged off Christopher Schindler to steer his header in to the corner. Another assist now means only Manchester City trio Leroy Sane, Kevin De Bruyne and Raheem Sterling have created more goals than Gudmundsson since the start of last season. The home side preserved their slender advantage until the interval but they were made to work for it. Tarkowski was forced in to another desperate block to deny Philip Billing after Mooy had driven in to space down the right hand side. Rajiv van La Parra had a sight of goal following a give and go with Alex Pritchard but the Dutchman got his right-footed finish all wrong when opening up his body in search of the far corner. Erik Durm couldn't cushion Billing's deep cross towards goal when unmarked at the far post while Laurent Depoitre struggled to adjust his body in time to steer the ball on target after Tarkowski failed to cut out Pritchard's delivery. Mooy headed over early in the second half when finding space on the penalty spot from Durm's cross as the Terriers continued to show their bite. The hosts did have a chance to double their lead when Gudmundsson and Vokes were in cahoots once again, after Aaron Lennon had picked up the ball on the left hand side of the six yard box, but the striker's flick wasn't strong enough to take the ball away from Lossl. The momentum was building, Town continued to probe, and they had their reward in the 66th minute. Chris Lowe collected possession, lifted his head briefly, and whipped the ball in to the box where Schindler jumped above Mee to glance the ball in to the corner. Neither side could impact where it mattered after the equaliser, with a disjointed display from the Clarets causing frustration, and the points were shared at Turf Moor.